Just Romantic Suspense: Is snoring okay or a deal breaker? Is snoring okay or a deal breaker? Congratulations to "Erin", the winner of Amanda's giveaway. Thank you to all who participated! Jessica Rossi has seen her share of drama. Dealing with a risky pregnancy, facing the pain of being a jilted bride, and now she can add hostage survivor to that list. I recently had the opportunity to sit down and pick her brain for a few minutes. She dished on everything from her new husband Shawn Delaney (and former superior) to her ex-fiancé Shock Woods to her feelings on being dragged half-way across the world at the hands of a deadly, most wanted, Italian criminal. Nothing was off limits. Enjoy! Amanda: (setting up recorder) I want to first say thank you for agreeing to this interview Ms. Rossi. (thinks to self, crap, wrong name!) I’m sorry, it’s Mrs. Delaney now, right? Jessie: (smiles and waves off name slip.) Don’t worry about. Just call me Jess. (Giggles) Sometimes I forget too… And then Shawn’s snores wake me up and I remember. Jessie: (nods excitedly) Definitely the cute snores. It’s the only time I get to see him completely relax. I love it. Amanda: (nods and smiles) So, new hubby and new baby. Do you ever get the feeling of Déjà vu? Like it’s the same situation, just different players? Jessie: (laughs) You know, I can see how people might think that, but I really don’t. Yes, Shock and I got pregnant and planned a wedding, but I’ve never compared that to what me and Shawn have. It’s completely different. Jessie: With Shock I would always worry. We were young and baby plus marriage were two things neither of us were ready for. I always had this little voice inside of my head trying to warn me. It’s like I knew something was off, but I just kept going because I loved him and wanted it to work. Jessie: (grins wide with a faraway look in eyes) With Shawn, I just enjoy the ride. I get to wake up each morning and know that no matter what happens, he will still be there and he will make sure everything is okay…No matter what happens, I know that he will always love me. (pats belly) That he will always love us… Every day I wake up, is another day I get to fall a little deeper in love with my best friend. And trust me, there’s no greater feeling than that. Amanda: (wipes at eyes discreetly) It sounds like, you’re living every woman’s dream. Jessie: Yeah, I guess I am. Amanda: (shakes head and smiles) Okay, let’s change gears before the heavy waterworks start. Let’s talk about Gustavo Brambatti. Can you sum up in three words or less what is was like to be his willing hostage? Jessie: (bites lip while thinking) I guess there’s only word that fits, sorry if it’s too simple. But hard is how I would describe it. I wanted to save Tricia, to find Kayla, and the rest of the victims, but I was torn. I couldn’t fight back how I wanted to. I felt helpless and…well, I just wanted it to be over. Amanda: (nodding) I can’t begin to imagine how that must have felt. Now that you’re safe back in the US, it must feel like a weight has been lifted. Jessie: Well, I’m definitely happy and relieved to be back at home, and even more so that we were able to bring everyone back to their families and friends. That’s something that wouldn’t have been possible without my fellow teammates. Amanda: Your teammates with the Tactical Response Unit? Jessie: Yes. I knew they would stop at nothing until they found us. I owe them my life. Amanda: You guys seem to work well as a team, that’s for sure. One more question before I go. If you could change anything about this experience, what would it be? Jessie: (smiles) As hard as it may be to believe, I wouldn’t change anything. This experience challenged me, made me question my beliefs, and even who I am at times, but I wouldn’t change one minute of it. There’s an Italian saying that says, “chi ha avuto ha avuto e chi ha dato ha dato,” and it means what’s done is done. There is no going back. No changes. You accept what is, and move on to better things. And that’s what I’ve done. Amanda: (smiles back) And on that note Jess, I want to thank you for taking the time out to meet with me today. I hope we have a chance to do this again one day. Jessie: The pleasure was all mine. And next time, I’ll bring Shawn. (winks) He owes me one. As part of an elite experimental police force, Jessica Rossi has been trained to handle any situation she encounters. For Jessie, putting away bad guys and ignoring her growing feelings for her team leader is all in a day’s work. When a new case gets a little too personal, she suddenly finds that even the best trained detectives sometimes bite off more than they can chew. With so much at stake though, she can’t afford to quit. Even if that means working side by side with the guy who ripped her heart in two… Or making a deal with the devil himself. Sleep habits. Is snoring okay or a deal breaker? 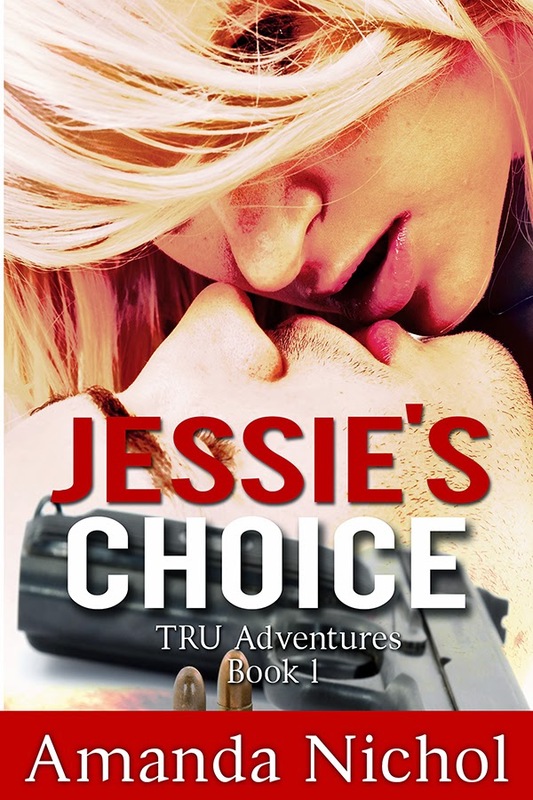 I will be giving away a copy of Jessie’s Choice to one lucky commenter. I stand still as one of Dex’s men rubs his hands over my body, frisking me for weapons. His hands linger a little too long on my thighs and I bite down on my tongue to keep from kicking him in his family jewels. I regret the fact that I wore a skirt instead of jeans, but I can’t do anything about it now. When Max, Travis and Tricia are finished being frisked, Dex motions us inside the room. He takes a seat, and offers one to Travis and Max who replicate his actions. My stomach churns when he winks at me. Breathe. Just Breathe. About Amanda Nichol: During the day when she’s not chasing her two year old around or their dog Boots, you can find Amanda glued to her computer, trying to make sense of all the crazy ideas floating around in her head. She loves everything romance related, and happily ever after is a must. At night you can find her in bed with a glass of wine, her Kindle and real-life Prince Charming. Currently her website is under construction so feel free to connect with her on Twitter. What an exciting plot! Off to add this to my shelf. What a great character interview! Jessie definitely sounds like she has a story I would enjoy! As for snoring... I grew up in a house with two loud snorers... so I can tune it out if needed. Thanks for sharing! Your nook sounds great! As for the snoring, I deal with it. Thanks for the giveaway. I'm the one who snores, so it better not be a deal breaker. Well, since I snore! and my husband doesn't complain to bad, guess it's okay!! The book sounds great. Thanks for the fun interview! Ummm... as long as i fall asleep first, I don't care :) Thanks for sharing and congrats to Amanda on the new release!